The course will "examine the relationship between sports, celebrity, and the power to communicate for social justice." Exploring how athletes and celebrities use their public profile to share their thoughts on social and cultural issues is certainly relevant. One of the prevailing storylines of this NFL season has been players protesting social injustice during the national anthem, a demonstration that has generated controversy among fans, media and even the President of the United States. We’ve seen such activism displayed in a variety of other sports as well, including the NBA, MLB and soccer. Glanville, 47, also has personal experience with social injustice that he can share with his students, as he has with readers of his recurring New York Times column. Three years ago, he wrote a column for The Atlantic in which he described being racially profiled while shoveling snow from his driveway by a police officer. 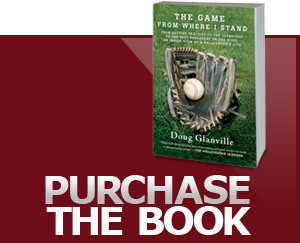 Yet Glanville also presented the other side of the equation this October, writing a New York Times column in which he explained the relationship and understanding of police officers that he learned through playing baseball with them as a New Jersey Little Leaguer. Taking those experiences into consideration, no former athlete and TV personality might be better suited to lecture on the relationship between celebrity and social injustice. Glanville is active on social media, but offers a thoughtful, reasoned perspective to sports topics and social issues, and will almost certainly bring the same approach to his college course. With ESPN cutting its baseball coverage and FS1 favoring more personality-driven analysts, this is an intriguing next step for Glanville in his post-playing and post-television career. Maybe he could land at a place like MLB Network in the future, but perhaps Glanville is looking at a bigger picture now beyond sports and sports media to use his experiences for education. He certainly seems to be the right guy for it.